Now that my book here is completed and actually in circulation (to positive reviews which is extremely pleasing and a relief!) in between my guiding I’ve been able to head out on my own for a few sessions here and there. There have been a lot of small bass (1-2lb) around for weeks, with my clients enjoying some excellent sport on surface lures in daylight and on Needlefish or weedless soft plastic lures by night. Indeed, this is precisely how I’ve managed to seek out and catch the bass depicted in the following two sessions that I conducted; one under a bright sunny sky, and the other on a clear and quite a chilly night – very conflicting conditions in which I’ve had to think around the weather conditions. I’ve mentioned it before, but when the Sun is blaring down from a cloudless sky and the water is calm and clear, I either head for the remotest and snaggiest (rough terrain) venues I know and target bass with the more natural looking weedless soft plastics or I look to cast and retrieve surface lures in areas affected by substantial levels of current. On this occasion, I chose to fish the latter. So with my new shades on and sunscreen applied I embarked on a relaxing afternoon solo session on a mark that can be excellent during the flooding tide. Essentially, it is a headland jutting out into a fierce tidal flow where a half-a-dozen or so car/bus-sized rocks are grouped together causing a number of eddies to form. What is notable about this mark is that it is one of the few places where I cannot actually stand in at low water due to the depth being at least 3m on the very lowest tides and 8-9m over high water springs – which is a very deep water venue for me! A lure that I have witnessed a number of clients catch bass on this season is the Xorus Patchinko 125 here surface ‘slider’ that sits (in relation to size and weight) between the excellent 129mm 15.5g Xorus Frosty II here and the larger and highly productive 137mm 36g Patchinko II here. Now, I have to admit to initially being very suspicious of the ‘Patch 125’ as at 18g and measuring 125mm I couldn’t really see the benefit of it over the ‘Frosty’ – which incidentally is a lure I always carry with me. However, upon seeing it in action and having a few flicks with it on client set ups, alongside its ease of use and apparent fish catching capabilities I succumbed and purchased two of them! The Xorus Patchinko 125. Not a ‘gimmick lure’ or an attempt to capitalise on the reptutaion of its stablemates by any stretch – something that I did take some convincing of at first. 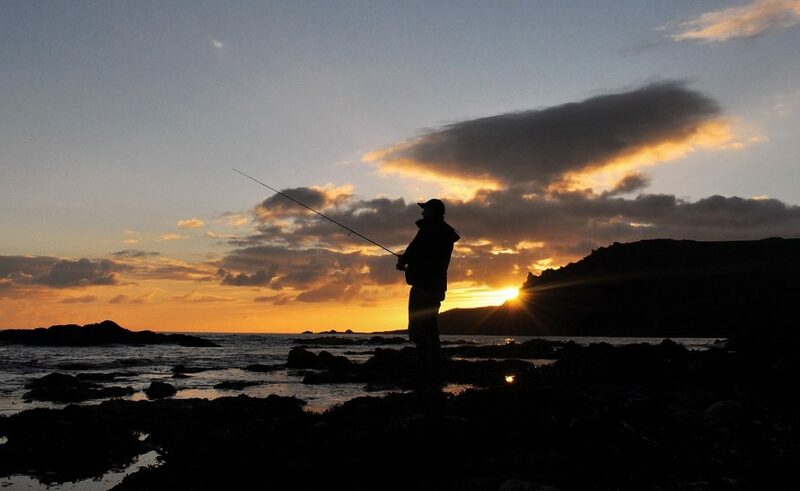 It was just wonderful to be out on my own fishing I won’t lie – but one of the many benefits of being a professional guide and assisting my clients is that when I do go fishing I am instantly tuned in to what is required in regards to lure selection and tactics. To me, everything today said ‘surface lures’ and with a slight headwind and the desired target area a good 40m out I instantly thought of the two pristine pieces of hard plastic that I had stashed in my bag and still in their boxes. Swish!!!! My treasured Major Craft Skyroad 862ML flexed and the ‘Patch 125’ sailed out like a missile before splashing on the seaward side of a large submerged (by only a few centimetres) rock and I began that tick-tocking motion with the rod held up at 45º. SWIRL! First cast – but no hook up. But I was positive, even at that range, that it was a bass and not a garfish or mackerel. Five casts later I changed position and decided to launch the lure in behind another submerged rock. I say ‘behind’ as from where I was stood the tide/current was hitting the outer edge of the structure, which is exactly where I envisaged the bass would be waiting for items to come to them in the flow. SPLASH! Fish on – but the battle was short-lived as a two pounder was brought ashore with another one of the same size visibly swimming underneath it. The first of six bass all taken ‘off the top’ on a very bright day when the sea was calm and clear. Getting the venue and tactics right is paramount if you want to catch bass in these conditions from the open and rugged coastline. A further couple of casts into the successful area didn’t attract any interest, therefore, I made a really long smooth cast a good 15m beyond my ‘initial rock’ and started to work the lure in that turning, spitting, slashing motion. BOOM! A decent bass hit the lure very hard and proceeded to launch itself and one of its compatriots clear out of the water – boy did this fish want the lure! I knew straight away that it was a better bass (although not huge) as it headed out from behind the rock and into the faster moving water whereby it stayed deep with its head shaking slowly – what a feeling through a rod with this much ‘feel’. Another lure that has well and truly forced its way into my lure box – I might need to buy a bigger box soon! The bass stayed under the surface all the way to my stance, cutting through the clear water in front of me like a Great White, with once again, another two bass of a similar size this time keeping it company. I guided her onto a flat platform and into a rock pool that was now being stirred by aerated water before unhooking my prize, grinning for a very quick snap and returning her to the same pool as quickly as I could given the strength of the sunshine and the possibility of more bass! I managed a further three bass from this mark (in the 2lb range) all within close vicinity of that group of rocks with each of them being escorted to my position by members of the same shoal presumably. There must have been a lot of bass around, but as is often the case on this venue, once you get into the final hour of the flooding tide they tend to move on and elsewhere. Following a one mile hike along the coastal path I clambered down a grassy cliff (sounds dangerous but I can assure you it wasn’t) before climbing over the rocks to an area that generally produces better fish once the Sun has set behind the high cliff behind you. In contrast to the exposed islands of rock of the previous mark, this one is more of a ‘bay or cove’ that is subjected to increased tidal movement on the ebb by virtue of the way it is geographically positioned. The water here is shallower at 3m, meaning the seabed is uncovered on all low tides – a seabed made up of a flat, gently sloping expanse of rock with a number of dining room table-sized rock pools sporadically positioned and that the bass, I’m sure, investigate and hold in at certain stages of the tide. With my lure of the moment still attached nothing happened while the tide was still flooding and over the high water period – something I wasn’t entirely surprised at as I had arrived on the mark a little early. However, once the tide began to ebb, the Sun had lowered further and the light levels had decreased very slightly a huge swirl (at range) followed by a second that this time caused the rod to lurch downwards signalled a bass intent on grabbing what I presume it thought was a creature in distress – due to the long pauses and only occasional bouts of movement I was applying to the lure. The bass did what many of them do when hooked and swam towards me steadily before splashing on the surface around 15m out in the more coloured water apparent due to the rotting seaweed heaped up on an adjacent cove – this bass looked pretty decent too! It then attempted to pull the line over a finger of rock to my right, but as I was positioned quite high up on the rocks I was able to turn it successfully – now to land it! There was a lovely little platform beneath me, but I would need to time everything ‘just right’ in conjunction with the 1m swell to guide a bass that I estimated to be well over 4lb (and yet again, with another of the same size acting as its chaperone) onto it. I always carry a net when guiding others but never when I’m alone and in this moment I was regretting that decision! I took my time, maintained an appropriate amount of pressure on the fish and the hook-hold and enjoyed watching both fish meandering around in front of me before gently ushering my catch safely onto the flat rocks – Get in! An ‘OK’ photograph taken with my replacement camera. It doesn’t detract from the fact that I was chuffed to bits to eventually land this one though! After returning my bass that measured 57cm (around 4½lb) I decided to call it a day and return home for a planned curry in my favourite Indian restaurant (the Maha Bharat in Kingsbridge here) – life doen’t get much better does it! It was unfortunate, as I reckon the bass were likely to appear or were in residence, but I just couldn’t position myself and retrieve the lures in the way I wanted due to the wicked crosswind. Therefore, I decided to move to what I hoped would be a more sheltered venue – a shingle beach swept by a lateral tide. It was OK but not ideal, as the wind was against the tide somewhat, which in the very shallow water I was fishing into can deter the bass somewhat. For an hour or so I plugged away as it were, but I wasn’t entirely comfortable and my levels of enthusiasm began to dwindle (it was 0330 and nippy to say the least!) as I considered my next move. It would require a further 15 minute walk, but a tiny cove with high cliffs surrounding it has been a reliable little venue in the past, particularly over the high water period, and I knew I would be unaffected by the wind. At 40m wide, a shingle bank slopes down onto an area of completely flat, featureless and more or less barren platform of rock for 20m before a sudden ‘drop off’ of approximately 1.5m into a gully that runs parallel to the beach. What is remarkable though, is that all of the bass I have caught or have guided clients to from this beach have hit the lure within five metres of the shoreline in exceptionally shallow water (no more than 40cm on the very highest tides) rather than further out in the vicinity of the more obvious ‘feature’. With twenty minutes until the top of the tide I arrived with my normally very reliable Albie Snax here attached and began to cast, retrieve and move a couple of metres along the beach in an attempt to search the area out. High tide arrived without a sniff which was when I decided to take a quick break, pour the remnants of luke warm coffee and drink it while contemplating the long walk back to the car or continue over the dawn period – where were these bass! Stuffing a sweet in my mouth and with renewed vigour from the shot of caffeine I began to work the beach and underwater reef in front of me. Ten minutes into the ebb and as I was on auto-pilot with the lure slaloming into, you guessed it, the final five metres of water towards the beach and in perhaps 20cm of water the rod THUMPED down. At last! The fish felt the large 6/0 weedless hook and shook its head a few times – it felt small though. But then, the rod bent over and stayed over as the bass attempted to head out to sea taking three or four metres of line against the drag in the process. It turned and ran parallel and to my left which was when I clicked the ‘on’ button on my head-torch – there she was, that beautiful silver flank ghosting through the shallows. The sudden light stunned this bass a little, I think, as from that moment it allowed me to bring her closer with only the odd shake of the head and turn of its body. I felt like I’d deserved this one and was especially careful not to rush things until about a minute after banging on the light she touched dry land – I was very happy I can tell you! Despite their rigidity, if the Albie Snax lures are rigged correctly and able to slide a little when ‘wiggled’ around the bend of the hook the hookup rate is exceptionally high when a bass hits them at velocity (which they invariably do). The Albie Snax, alongside a brilliant and secluded venue had come to the rescue. I fished on for a further 20 minutes but decided I had demonstrated enough dedication for one night and huffed and puffed my way back to the car, before driving home and crawling into bed. About as beautiful as bass can get – that this one felt confident enough to venture into water barely covering its back still amazes me. For its size (57cm and around 4½lb) this fish had a real ‘spade-like’ tail and has to be one of the prettiest bass I have caught this season. I’m so glad I replaced my broken camera and was able to do the moment justice. I look more alert than I actually felt! Although the adrenaline created by hooking and landing these wonderful fish quickly overcomes any tiredness. If you are interested in purchasing my book (that was released on the 8th October) titled ‘The Lure of The Bass’ please see my recent blog post here for details on how to purchase a copy. 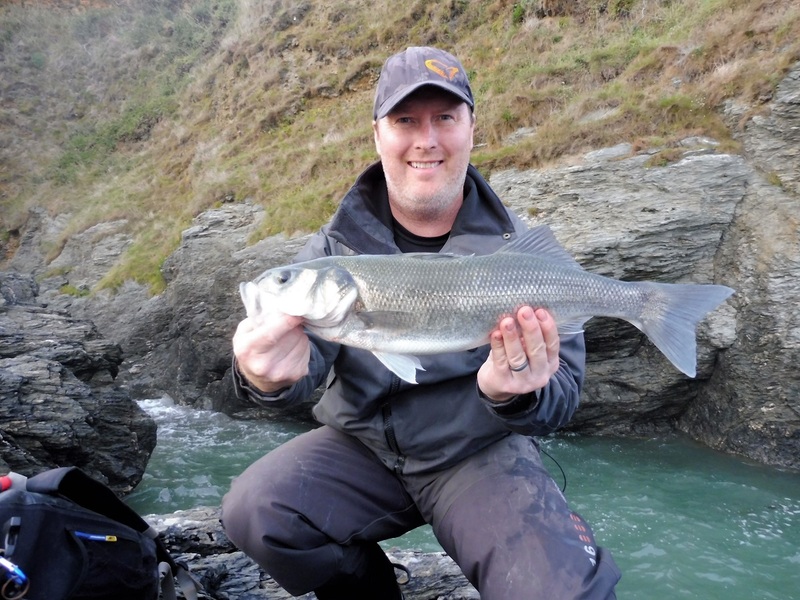 Great to see you out and about fishing Marc and catching some silver babes, nice. What camera did you go for? Retired my rods for the Winter now but looking forward to Spring 2019. Been a good season for me ( best yet) using mainly surface lures which I’d never done in anger before. HTO Climax, S.G Surf Walker and Patchinko worked so well, particularly the S.G Surf Walker picking up the better fish, sadly lost today so p***ed off. Bought a new rod too. Thank you Laurie and great to hear you’ve enjoyed a god season. I replaced it with the same camera, a Sony Cybershot HX90V.